← SYRIZA: Was capitulation inevitable? With Jeremy Corbyn’s grassroots campaign in full swing, we must decide how to best orientate towards the front runner for the Labour leadership position. There’s no doubting that his campaign has opened up the space for the left to break the hegemony of neoliberalism and counter the political shift to the right. To understand the tradition Corbyn comes from, we have to go back to the founding of the party itself. The Labour Party was originally founded by the growing trade union movement in the United Kingdom as the political wing of emerging working class politics. From its conception, the Labour Party and the trade union movement have been inextricably linked, with affiliated unions being an integral part of party democracy. However, mirroring the trade union movement, the party had severe internal contradictions between its base and a pro-capitalist leadership. The fact that Labour was a workers’ party meant inevitable conflict with capital, and as seen when Labour faced the pressures of government, capitulation to capital was the only outcome so long as there was a leadership orientated towards reforming of capitalism. Up until John Smith’s ascendency as leader of the Labour Party, the trade union leadership could exercise a bloc vote of 40% for things such as the leadership elections and party conferences, giving the movement serious control over the party’s direction and policy. Under Smith, this was lowered to 33% with the electoral college system which weighted the Parliamentary Labour, Constituency Labour and Affiliated Union votes equally. Under so-called “Red Ed” Miliband’s infamous-yet-mythical “left turn”, the electoral college was abolished entirely in 2014 for the “One Member One Vote” system. As a result, all 2.7 million union members were deprived of any representation within the party barring their individual vote – if they were a registered voter, which almost all are not. Labour’s last tethers to the organised working class are beginning to be cut, with the Fire Brigades Union and RMT ending their affiliation with the party, and the largest union, UNITE, not so far behind. Since the left’s peak of influence in the Labour Party in the 1980’s, membership of the party had dropped from over 5 million to a low of around 100,000 during the Blair era, though it has begun to slowly recover. It was in this context that Corbyn was nominated by 36 Labour MPs(35 are required to achieve the nomination). Many of Corbyn’s nominees were Blairites and open opponents, but their nomination – which they are now likely regretting – held a dual purpose; Firstly to appease the trade unions and allow the Labour left to be nominally involved in the process, and secondly to split Andy Burnham’s vote to his left – Corbyn’s genuine support base within the Parliamentary Labour Party numbers is well short of the 36 who nominated him – the Socialist Campaign Caucus only has 9 MPs, Corbyn included. Similarly, only 6% of Labour councillors – traditionally considered to be more left wing – have expressed support for the Corbyn campaign, and many of these still impose austerity, applying the “There Is No Alternative” mantra. It’s clear then, that the including of Corbyn in the leadership race was a primarily tactical move by Labour MPs to keep the left and unions tied to the party’s rightward trajectory. However, even this was only given under pressure from a quickly organised pressure campaign from Corbyn’s supporters. What few people expected was that he would take the leadership race by storm, tapping into a very potent anti-austerity mood in the British working class. As well as throwing the machinations of the Labour right into disarray, it also shows the utter bankruptcy of capitalist media’s analysis of Labour’s defeat, with the absolutely bewildering claim that Labour had moved too far to the left. It was obvious then, but if people didn’t see, it should be clear now that Labour’s defeat was rooted precisely in its long standing shift to the right and thinly veiled Thatcherism. UKIP did not get the millions of votes it did because the English working class is especially reactionary, as some on the left would claim. The “surge” in UKIP support was a protest at the total betrayal of the working class carried out by Labour. There is a very clear space for anti-austerity, as well as Socialist, politics to enter the scene again, and the grassroots campaign around Corbyn is an expression of that. The question that often develops amongst sections of the Socialist left when figures such as Corbyn crop up is – are they genuine? Are they principled Socialists? The answer to that question is always more complicated than many people care to consider. Corbyn has been a long standing member of the Labour Party. He resembles the last vestiges of the Old Labour left and “Bennite” politics. One has to question the politics of staying in the degenerated monstrosity that is the Labour Party whilst also claiming to espouse Socialist politics. This is a legitimate concern to make – how could any self-professed Socialist seriously maintain a relationship with what Labour had become? Some would claim that the current state of affairs, with Corbyn leading the polls by a significant margin, justifies this. The reality is that nobody could have predicted the current state of affairs in advance. However, that statement can easily be turned on its head – that because Corbyn has remained a Socialist throughout his time in Labour, that he will not betray his principles now and is, as such, a reliable leader on the left. Allow me to head off this sentiment – it’s an easy position to be principled and Socialist when you’re not in a position of power, faced with the massive pressures of conflict with capital. Already Corbyn is being shown to soften under the pressures from the right, taking a vague stance on topics such as Clause IV and the reorganisation of Labour into a mass workers’ party organised around Socialist ideas and struggle, going so far as to claim he would allow some of his Blairite opponents into his Shadow Cabinet – a critical error. These are issues of concrete importance which Socialists can’t simply overlook as a necessary evil. Without the fundamental reorganisation of Labour on an adamantly anti-austerity(And necessarily Socialist) basis, it will be utterly necessary to continue to run candidates and organise in opposition to Labour, regardless of the result of the leadership elections. Simply put, the right wing must be brought to heel or expelled from the party. Any other option would be to continue in thrall to the right wing tendencies. Corbyn and the left will not have any measure of concrete control over the party until the dissident elements of the party are handled. On a matter of principle alone, Corbyn has no leg to stand on, ignoring the Labour Party whip repeatedly during his time as MP, it’s clear the that Parliamentary Labour Party will not play ball with a left wing leadership and will attempt to oust him almost immediately. To prevent otherwise inevitable defeat – either through capitulation or ousting – there is going to be a need for struggle within and outside of the Labour Party in opposition to the right in order to resist the pressures put on a Corbyn leadership and generate the necessary political capital for maintaining a left wing stance. But how precisely “left” is Corbyn? In 1981, Tony Benn campaigned for Deputy Leadership of Labour on a platform of abolition of the House of Lords and nationalisation of the top 25 companies in the United Kingdom, and implementation of industrial democracy. Due to the betrayal of alleged allies in Parliamentary Labour such as Neil Kinnock, Benn lost by 0.8%. Corbyn, who stands in that same tradition, is calling for the renationalisation of the rails, post and energy, and to raise tax on the wealthy and on large capitalist enterprise. This is a call any Socialist should wholeheartedly support, with the caveat that simply stateizing of elements of the economy is not Socialism in of itself. 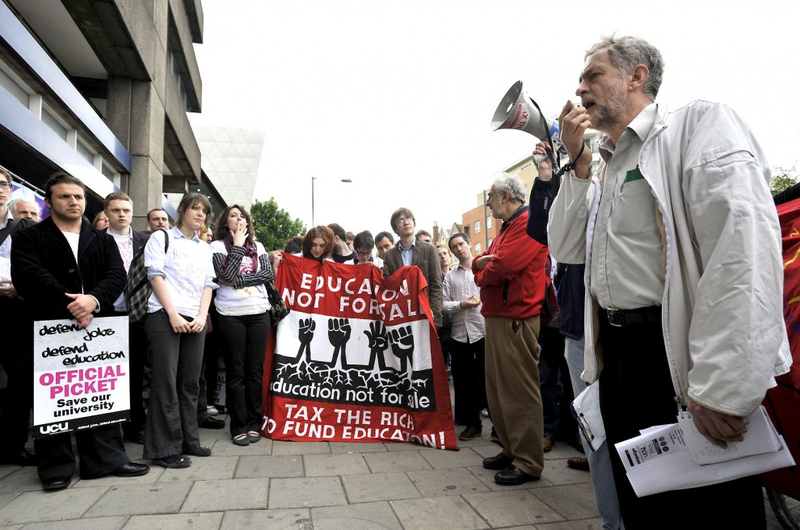 In addition, he seeks to undo damage to the NHS and provide free tuition to third level education. These will all undeniably have positive effects on the living standards of workers and will garner popular support going forward. As Socialists, however, we must not be content with a left-reformist program, which is ultimately all that Corbyn is offering and will ever offer, such is the tradition he stands in. The fundamental contradictions of reformism are such that upon gaining state power anywhere, one simply cannot reform Capitalism into a Socialist society. It requires concretely revolutionary action and a transfer of the levers of power from the hands of the bourgeoisie to those of the working class – you accept the logic of Capitalism and the markets, or you do not. Time and time again we see the concrete failures of a reformist programme. The most recent example at the time of the writing of this article is the collapse of the SYRIZA government’s mild left programme to relieve the humanitarian disaster in Greece, under pressure from international capital. We can also witness the limits of reformism by looking abroad to the Pink Tide in Latin America, with the ongoing collapse of the Chavista regime in Venezuela under both ineffective management of Capitalism and active sabotage. Similarly we can also look to past Labour governments in the UK and the demonstrable reality that it did not produce Socialism, and despite this there were active coup plots against Labour governments, in the same vein as the vile coup led by Augusto Pinochet in Chile, which toppled the Allende government. Consequently we have to acknowledge that no matter how positive the incremental reforms are for the working class – and we must absolutely fight for these reforms – in the current period of Capitalism, the ideological hegemony of Liberalism is so severe that the capitalist class will resist with every weapon in its arsenal, just as it is everywhere else across the world. The only conclusions we can draw from this is that a revolutionary transfer of power from the bourgeoisie to the organised working class is not simply the desirable or preferred course of action, but the only course of action. It should be needless to say that here, there is no common ground with Jeremy Corbyn – likely there would be little common ground with the working class as things stand, either! Is that to say Corbyn does not support a Socialist transformation of society? No. I believe that he is quite genuinely a Socialist, and he is definitely the most left wing candidate to enter mainstream discourse in decades. Ultimately, however, without a transitional programme and a politics geared towards preparing the workers for conflict with capital, Corbyn will not be able to mobilise in resistance to the pressures of capital. This programme should involve the nationalisations of the largest companies and of the commanding heights of the economy under workers’ management, and the opening of books of the remaining private enterprises. Without such a programme, Corbyn is not capable of leading the working class into Socialism, even if it is his intention to do so. In this context, then, whether or not Corbyn is a genuine Socialist does not concretely matter, so long as he isn’t willing to take the necessary steps. The age old question, then, which every Socialist must grapple with – how do we move forward? What is the course of action? In the context of a working class which has been under constant ideological and material assault since the collapse of Stalinism, and a weak revolutionary left, our main task must be to build our organisations and agitate for revolutionary ideas on the best platforms possible. Enter Corbyn. As with the Sanders campaign in the USA, Socialists must meet the workers where they’re at and push them forward. Unlike the Sanders campaign, this is a conscious struggle between left and right for control of a degenerated party of the left, a struggle which hundreds of thousands of advanced workers have entered into and possibly millions thereafter. A Corbyn victory will likely result in a rupture of some form, all of which benefit us. Either there is a right wing exodus from the party, or Corbyn is brought down by the right, resulting in a left wing exodus. In both cases, there is potential for a new workers’ party orientated towards Socialist goals. Should the right be forced from Labour, the organisational vacuum created would require a dramatic reorganisation of the party on a left wing basis, during which time the revolutionary left can exert what little influence it has in the most optimal manner. Conversely, a left break with Labour would result in a reorganisation of the left outside of Labour and would provide the genesis for a new mass workers’ party and a pole of attraction for radicalised workers who will now see Labour as the dead end it has long been. By necessity the orientation of this party will have to appeal to a broad layer of workers, both the explicitly revolutionary as well as the reformist elements. It will be extremely fertile ground for intervention of revolutionary forces to agitate for our ideas and to build our own organisation. From this base we can develop a revolutionary party from the most conscious elements. Corbyn’s position on the national question is one often overlooked in left analyses. As an Irish Socialist this is, for obvious reasons, of special interest. Corbyn’s position on the national question is really little different from the orthodoxy of Old Labour leftists, and in this case it ought to be found lacking. 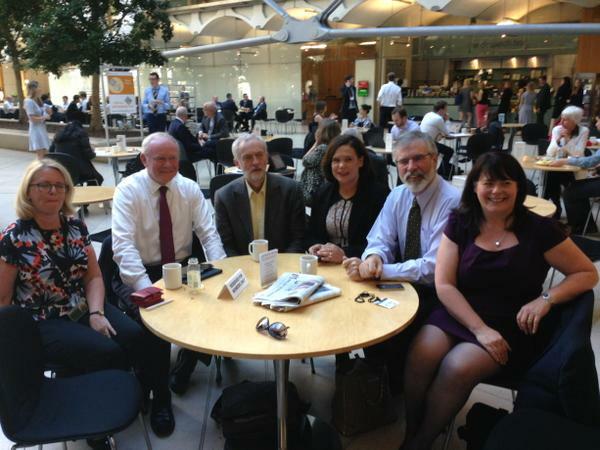 Corbyn, like many others before him, support a unification of Ireland. The logic behind this is, is that British Imperialism has no place in Ireland, that Britain has no right to Northern Ireland and that it should withdraw from Northern Ireland. On the face of things, there’s little that you can seriously disagree with. The Northern Irish state is a sectarian, imperialist entity, and the Old Labour left view which was essentially one of critical support for the IRA and for a unification of Ireland was, in many ways, radically progressive for the English left. Corbyn makes no bones about similar views on Hezbollah and Hamas in their struggle with Israel. However, the critical error in supporting the reunification of Ireland on the basis of Capitalism is that there are some 1 million Protestant workers, which almost entirely reject unification with the Republic. Obviously, there is a tradition of Protestant Republicanism – going all the way back to Wolfe Tone, the radical republican who tried to export the French Revolution to Ireland – but the situation on the ground remains that the Protestant working class is overwhelmingly Unionist. To support a reunification on that basis is to drive forward a situation from which the only outcome will be a sectarian civil war. The acknowledgement must be made, that to end imperialism in Ireland, a mass workers’ movement against Capitalism itself must dominate the agenda so that Catholic and Protestant workers can unite under the banner of Socialism, to act in solidarity and resist sectarianism. Simply put, Irish unification can only avert disaster if that unification happens on the basis of Socialism. The role of a British left government should be to facilitate this process, not prematurely propel it. In stark contrast to the position on Ireland, Corbyn is a hardline Unionist in regards to Scotland, rejecting even the possibility of devolving powers to Scottish legislatures, let alone entertaining independence. There is a good reason for this. Historically, Scottish nationalism has not been progressive, if anything it has always been a very right wing, reactionary position. It was not too long ago that the Scottish National Party was the “Tartan Tories”. It’s in this context that Corbyn’s position developed. But that this position hasn’t changed over the past years shows a failure to adapt to the changing nature of Scottish Nationalism. Corbyn has been vague on whether he would support a second referendum – saying it’s a matter for the Scottish people and UK Parliament – it’s quite clear where his position is on Scotland and should he take control of the Labour Party, it is also quite clear that in the upcoming referendums on Scottish independence, once again the Tories and Labour will be united in their Unionism. Without at least a position in support of heavy devolution of powers, Labour under Corbyn will not garner real mass support from Scotland – nor should it. The election result is not something that can be shaken off, with Nationalists utterly dominating Scotland by taking 53 seats. The context in which this campaign is occurring means that there can be no neutral parties which do not take a position concretely for or against the Corbyn campaign. Failure to do so – and in my view, failure to recognise the potential for the left as a result of this campaign – will lead to further isolation of the already marginalised parties of the left. I do not propose that revolutionaries simply dissolve back into Labour upon victory. Not at all. If anything, organisational independence in some form or another is going to be a necessary part of the left’s development moving forward, and we cannot simply let a Corbyn victory be the signal of a revival of Old Labour. Old Labour was not good enough then, and a reconstitution of it isn’t good enough now. However, a major shift to the left provides another battleground for Socialists to organise in and agitate for revolutionary ideas, and it would be remiss and a tactical error to abstain on this front no matter your overall position on Corbyn. Over 610,000 people have registered to vote, a quarter of which happened in a 24 hour period. These workers must be reached and not allowed to be mindlessly co-opted back into the Labour Party’s machine. This entry was posted in Bourgeois politics, Politics, Proletarian politics. Bookmark the permalink.